How involved is your business? At Square Cow Movers we help businesses in the communities we serve. We know first-hand how deeply most owners care about their community. Some may not realize, however, how important community involvement is for their day-to-day operations. Here are a few reasons why it’s so important for businesses to be involved in their communities. Consumers are more informed than ever before and they consider a lot more than the quality of a product or service. The businesses that a consumer chooses to work with is directly impacted by corporate responsibility and philanthropy. A poll conducted by Fortune magazine found that millennials prefer companies that give back to their community, and are more likely to recommend them to their friends and family. Another study done by Cone Communications and Echo Research found that corporate social responsibility was a consideration for 82% of consumers. In short, consumers recognize and appreciate when organizations give back to the community, and they are likely to direct their business to those who do. While working in your community you will meet your neighbors, who will then become personally familiar with your business. The strong bonds built with your public will have incredible benefits for your organization in the long-run. Ask yourself, “What will benefit my community the most?” Find an approach that will make a positive difference and fulfill a societal need. Whether it involves raising money for park improvements or sponsoring a school program, make sure that it is something that your company can get behind and remain passionate about. By dong this, you will create monumental waves in your community and solidify lasting relationships. Customers aren’t the only group drawn to philanthropic companies. Employees pay close attention to those who give back, as well. In fact, it is quite a powerful recruiting tool. The Fortune poll mentioned above found that 66% of millennials and a large majority of older generations seek employment from philanthropic companies. The draw is so powerful that 75% of millennials will take a pay cut to work for a company that is socially conscious. 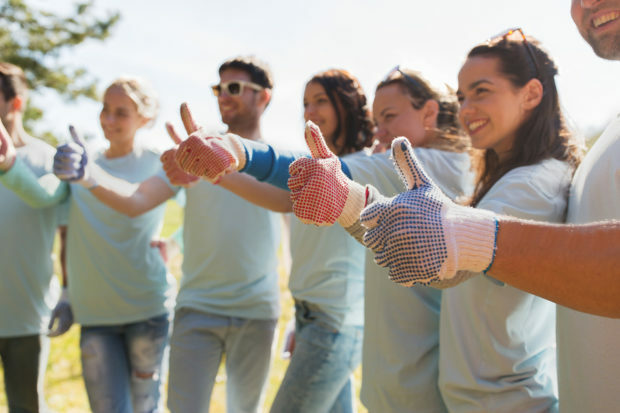 Giving your employees the opportunity to volunteer has even more impact. Initiating a volunteer programcan enhance engagement in the work place, build professional skills and encourage productivity- while supporting the community at the same time. Your local community supports your business, and it’s time to return the favor. A business’s societal involvement affects positive change and investment by bringing members of the community together to enrich lives. The health of your community has a direct impact on the health of your business, so get involved and all will prosper. At Square Cow Movers, we’re involved in the communities we serve because our customers are our friends! We believe so strongly in community involvement that we award the Square Cow Movers Scholarship for Community Impact to one student each academic year.